Rabbie Nassrallah, aka Nasseman, hails from Liberia on the West African coast. Born in 1979 to a Lebanese father and Liberian mother, Rabbie grew up in Liberia’s bustling capital, Monrovia. As a young man, he witnessed the devastation of Liberia’s 1989 – 2003 civil war, a period which helped to shape his strong sense of social justice. Jonathan Koffa is better known to his fans as Takun J, the Hip Co King. Photo by Chad Stevens, UNC Journalism. The empowerment of the voiceless is central to my passion for communication. Never before have the masses had such an opportunity to speak for themselves as today. A cellphone video can change the course of a revolution and amateur photographers can capture the life of their small villages to share with the world. Bringing the technology and craft of storytelling to the world’s masses while being a minister of communication is my intent. I hope to enable people to speak for themselves and impart a thirst for knowledge. Years ago, I believed a lot of things. I believed what everyone around me believed. I viewed the world through my mid-western 1980’s conservative lens: the world was one dimensional, and I was just fine with that. Turning on the TV, Peter Jennings would inform me about the world outside my community; I assumed that was the end of the story. I always knew what to expect and that’s what was delivered on a daily basis. Then, something changed inside of me. It was not sudden, but an evolution of knowledge gained by being exposed to the greater world through sitting and hearing others’ stories. I became informed, not by Ted Koppel but by those who were living their stories. A Palestinian sipping tea in the Occupied West Bank, an Israeli sitting on the beach in Tel Aviv or a Liberian hip-hop artist drinking a Club beer in Monrovia, these stories came alive to me in a way that could never have happened if told from an outside perspective. We no longer have to rely on the single-sided story. In our modern age, people in rural villages can Tweet about impending danger and a child can hear all about it in Fort Wayne, Indiana. This is an exciting time and I am truly humbled to be a part of it. As an Assistant Professor in the S.I. Newhouse School for Public Communications at Syracuse University, I have been able to put into practice what I believe is one solution to so much of what ails us as a species. Communication empowers, informs and excites others about our common humanity. Through my engagement with human rights efforts, extensive experience of working with the storytellers of Liberia, involvement of students and ministering about the power of storytelling, I have been able to return with knowledge and excitement to the classroom. I have created and led large multi-university international projects, keep technically and creatively current through web design projects and I am working on centralizing and extending my efforts by leading the development of the next phase of what Newhouse does globally. One of my greatest pleasures in being at Newhouse is the openness and excitement of bringing the classroom into the world. I have taken two groups of students to Liberia, one as part of the Together Liberia project and most recently as Director of Digital and Visual Media for New Narratives. During the Together Liberia project I was able to bring five Newhouse and one Robertson Scholar from Duke University to participate in this six university international media development project. There were a total of 5 independent studies conducted during our 3 month time in Liberia producing videos, photography and training local storytellers. During the the winter break of 2012–2013 I took four Newhouse graduate students to create a fundraising documentary on the FrontPage Africa reporters and New Narratives fellows. This was shot and produced in conjunction with U.S. based Newhouse graduate research assistants initiative on writing a Kickstarter campaign that is currently awaiting final approval. From these efforts I help to strengthen democratic values and civic responsibility, address and help solve critical social problems; and contribute to the public good. This has all come together, contributing to the enrichment of my teaching, service, and scholarship for the S.I. Newhouse School of Public Communications at Syracuse University. I have been traveling to Liberia extensively for over five years. Initially I was invited to direct media training by Michael Keating, Director of the Center for Peace, Democracy, and Development at the University of Massachusetts Boston as part of a U.S. Agency for International Development (USAID) media development project. It was in this situation that I realized what was needed to truly make an impact in the lives of these Liberian storytellers: a long-term commitment to forging relationships that result in progressive change, and this does not happen at Twitter speed. There’s a saying in Liberia, “Small Small”, meaning true change runs deep and it takes time. After several smaller trips to Liberia to conduct media training I was able to develop a better understanding of the needs of the storytellers there, both journalists and artists. It was during this time that I was able to evolve my relationship with the Liberian media to a longer-term, fruitful one through three main projects, Together Liberia, New Narratives and the Community Artist Stock Agency. In an effort to shed light on the Ebola crisis in Liberia, center director Ken Harper, partnered with assistant professor Steven King of the University of North Carolina at Chapel Hill. They mobilized a team of developers and designers that quickly created an interactive online data visualization website that shows the Ebola outbreak as it happens. The site offered government officials and the public immediate access to constantly evolving information. In an effort to help free jailed Liberian newspaper publisher and editor Rodney Sieh, I led a team of students to create a media campaign to raise awareness and apply pressure to the Liberian government. The campaign included a website, online petition, letter writing, branded apparel, video production, political cartoons and meetings with the Liberian president. Sieh was freed in December 2013. In 2012 I joined New Narratives as the Director of Digital and Visual Media. New Narratives’ (NN) is a non-profit organization helping media deliver independent, truthful information to its people so they can make smart decisions about their countries’ politics and resources, while keeping leaders accountable. 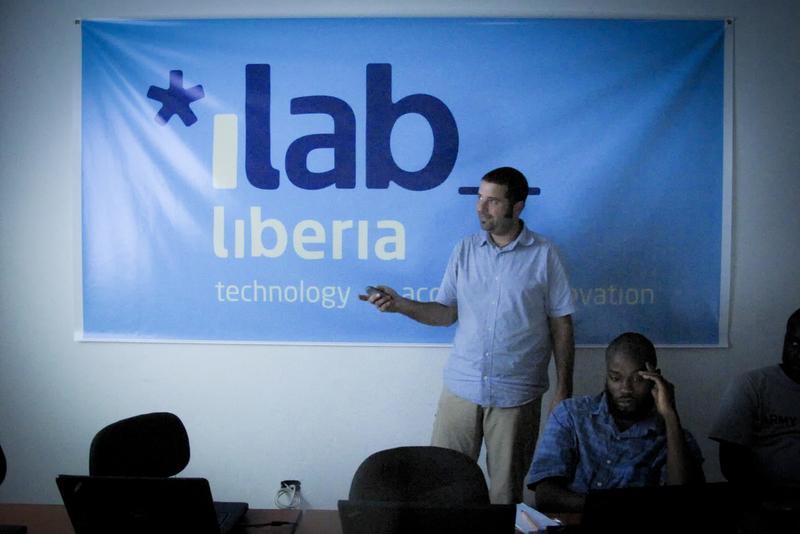 The purpose of this project was to provide for the information needs of the Liberian people in what might be the most important election in the nation’s history.